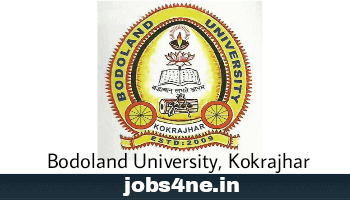 Bodoland University, Kokrajhar Recruitment 2017- 12 Nos. Office Assistant & Grade IV Posts: Last Date 05-06-2017. - Jobs4NE : Jobs in Assam and North East India. Bodoland University, Kokrajhar Recruitment 2017- 12 Nos. Office Assistant & Grade IV Posts: Last Date 05-06-2017. Bodoland University, Kokrajhar invites applications from Indian citizens for recruitment of below mentioned 12 nos. Office Assistant & Grade IV vacancies in fixed pay on contract basis for six months. Last Date for Submission of Application: 05-06-2017. Total no. of post: 12 Nos. 1. Name of the Pos: Office Assistant- 09 Nos. Scale of Pay: Rs. 6810/- pm. 2. Name of the Post: Grade IV- 03 Nos. Scale of Pay: Rs. 5070/- pm. 1. For Office Assistant: Grauate in any disipiline with one year Diploma in Computer appplications OR Graduate in Commerce with one year tally ERP training OR BCA with Science background with having good knowledge in written & Spoken English. 2. For Grade IV: HSLC/ 10th passed. Selection Process: Selection will be made based on Interview. How to Apply: Interested Candidates may apply in stranded form along with Mobile number, Email Address and all relevant documents. The complete documents have to send to the Registrar, Bodoland University, Debargaon P.O-Rangalikhata Kokrajhar-783370 Assam on or before last date.